All active members of the Sonoma County Forum must live or work in Sonoma County and be employed, own a business, or actively volunteer in community service to which they have made a commitment. Membership is open to all residents of Sonoma County and is limited to 125 active members. An applicant is admitted to membership after completing an application and being elected to membership by the Board of Directors and paying required fees (View Membership fees). Membership applications must be signed by two active members (these can be your sponsor(s), the Membership Chair or other Board member). 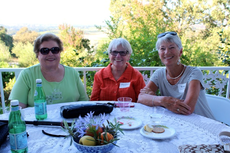 Why should you join the Sonoma County Forum? If you are looking for a place to meet other interesting women, learn new things from fascinating speakers, and have lively discussions on an array of topics, you'll find all this at the Sonoma County Forum! Be able to attend Members' Only special events and outings, and participate in book groups, dining-out events and walking groups. Read more about activities for our members. "There is so much variety and depth in the presentations." "Participation in the book group gives me an opportunity to know the members even better."